This is plate 15 from 'Sketches in Afghaunistan' by James Atkinson. 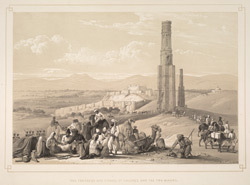 Having taken Kandahar, the Army of the Indus came upon the famously impregnable citadel of Ghazni. Built on a mountainside with thick, 60-feet high walls it presented a nearly insurmountable problem for the British who lacked heavy artillery. They were only able to breach the fortress because of the wiliness of Mohan Lal (a Kashmiri interpreter, spy and right-hand man to Sir Alexander Burnes), who managed to discover that one of the gates of the citadel was unwalled. Atkinson was impressed by the minarets of Ghazni: "The two Minars bear strong marks of former beauty and elegance, they are built of red brick, with most exquisite finish, in various minute forms, highly curious and ornamental."